Inuit art refers to artwork produced by Inuit people, that is, the people of the Arctic previously known as Eskimos, a term that is now often considered offensive outside Alaska. Historically, their preferred medium was walrus ivory, but since the establishment of southern markets for Inuit art in 1945, prints and figurative works carved in relatively soft stone such as soapstone, serpentinite, or argillite have also become popular. The Winnipeg Art Gallery claims to have the largest public collection of contemporary Inuit art in the world. In 2007, the Museum of Inuit Art opened in Toronto, but closed due to lack of resources in 2016. Carvings Nunavut, owned by Inuk Lori Idlout, opened in 2008 and has grown to have the largest private collection in Nunavut. The Inuit owned and operated gallery includes a wide selection of Inuit made art that has millions in inventory. Around 4000 BCE nomads known as the Pre-Dorset or the Arctic small tool tradition (ASTT) crossed over the Bering Strait from Siberia into Alaska, the Canadian Arctic, Greenland, and Labrador. Very little remains of them, and only a few preserved artifacts carved in ivory could be considered works of art. The Dorset culture, which became culturally distinct around 600 BCE, produced a significant amount of figurative art in the mediums of walrus ivory, bone, caribou antler, and on rare occasion stone. Subjects included birds, bears, walruses, seals, and human figures, as well as remarkably small masks. The Dorsets depicted bears and other animals in ivory with lines indicating their skeletal system incised on the surface of the ivory; bears in such a style are known as "flying bears". These items had a magical or religious significance, and were either worn as amulets to ward off evil spirits, or used in shamanic rituals. The Ipiutak culture seems to represent a classical period of Inuit development. The artwork is extremely elaborate, incorporating geometric, animal, and anthropomorphic designs. Around 1000 CE, the people of the Thule culture, ancestors of today's Inuit, migrated from northern Alaska and either displaced or slaughtered the earlier Dorset inhabitants. Thule art had a definite Alaskan influence, and included utilitarian objects such as combs, buttons, needle cases, cooking pots, ornate spears and harpoons. The graphic decorations incised on them were purely ornamental, bearing no religious significance, but to make the objects used in everyday life appealing. All of the Inuit utensils, tools and weapons were made by hand from natural materials: stone, bone, ivory, antler, and animal hides. Nomadic people could take very little else with them besides the tools of their daily living; non-utilitarian objects were also carved in miniature so that they could be carried around or worn, such as delicate earrings, dance masks, amulets, fetish figures, and intricate combs and figures which were used to tell legends and objectify their mythology and oral history. In the 16th century the Inuit began to barter with European whalers, missionaries and other visitors to the North for tea, weapons or alcohol. Items previously produced as decorative tools or shamanic amulets, such as carvings of animals and hunting or camping scenes, became trade commodities. Inuit artists also began producing ivory miniatures specifically as trade goods, to decorate European rifles, tools, boats, and musical instruments. Cribbage boards and carved walrus and narwhal tusks were intended for the whalers. Missionaries encouraged the use of Christian imagery, which was accepted to a limited extent. Traditionally, the Inuit carved objects for decoration, use in games, religious purposes, or self-amusement. However the nature and functions of Inuit carvings changed rapidly after contact with European and European-Canadian society. This change accelerated after around 1949, when the Inuit began settling into communities, and the Canadian government began to encourage a carving industry as a source of income for the Inuit. The art changed markedly from the form which prevailed in the past, in size, media, motif, and style. The Government of Canada's encouragement of commercial carving was initially heavy-handed, as is most clearly shown by the pamphlet "Eskimo Handicrafts", circulated among Inuit communities in the early 1950s. Intended to provide inspiration to Inuit sculptors, this pamphlet depicted artifacts in the collection of the Canadian Museum of Civilization; many of the objects pictured, such as totem poles, were not germane to Inuit culture. James Archibald Houston, the author of Eskimo Handicrafts, was later sent to Baffin Island to collect specimens of Inuit sculpture. During his stay there, he introduced printmaking to the artists' repertoire. Figures of animals and hunters, family scenes, and mythological imagery became popular. By the 1960s, co-operatives were set up in most Inuit communities, and the Inuit art market began to flourish. Since the early 1950s, when Inuit graphic styles such as stenciling and block printing were being developed, some Inuit artists have adopted a polished style rooted in naturalism. Other artists, such as John Pangnark, have developed a style that is highly abstract. Both styles are generally used to depict traditional beliefs or animals. Stone is a common choice for block printing, but its availability and the fact that the printmakers were often carvers familiar with the stone made it a good choice. During the mid-1980s one of the printmakers, Iyola, who owned a pool hall, experimented with slate made for pool tables and since that time this type of slate has been used for printmaking. Prior to that, stone from the region including steatite and talc stone were used. The final print is a collaboration between the printer/stone carver and the artist. The printer makes some artistic decisions regarding the final product. For example, if the original drawing has a lot of thin lines or intricacies, the printer/carver must alter the drawing in order to make it possible to carve it into stone. Specific aspects of the drawing may be altered in order to fit onto the stone. In one instance the neck of a duck had to be shortened, in another only a portion of the artist’s original drawing was selected for reproduction. Inuit sculptures had been produced prior to contact with the Western world. Today, Inuit continue to carve pieces entirely by hand. Power tools are occasionally used, but most artists prefer to use an axe and file, as this gives them more control over the stone. The final stage of carving is the polishing, which is done with several grades of waterproof sandpaper, and hours and hours of rubbing. The most common material is now soapstone, serpentine, either deposits from the Arctic, which range from black to light green in color, or orange-red imports from Brazil. Other material used in Inuit sculptures include, caribou antlers, ivory from marine mammals, and the bone of various animals. 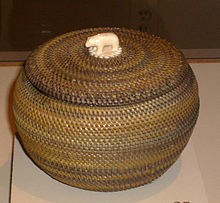 Wikimedia Commons has media related to Inuit Art. ^ St Onge, Colette. Symbols of Authenticity: Challenging the Static Imposition of Minority Identities through the Case Study of Contemporary Inuit Art. ^ Douglas D. Anderson. "Prehistory of North Alaska." In Handbook of the North American Indian, vol. 5, pp. 88–90 (Smithsonian, 1984). ^ Colette G., St-Onge. Symbols of Authenticity: Challenging the Static Imposition of Minority Identities through the Case Study of Contemporary Inuit Art. University of Ottawa Press. p. 29. Canadian Inuit Sculpture. Canada publication: Indian Affairs and Northern Development. ISBN 0-662-59936-5. Archived from the original on 2007-08-18. Blodgett, Jean (1991). In Cape Dorset We Do It This Way: Three Decades of Inuit Printmaking. Ontario: McMichael. Hessel, Ingo; Hessel, Dieter (1998). Inuit Art. An introduction. foreword by George Swinton. London: British Museum Press. ISBN 0-7141-2545-8. Eliot Waldman. Inuit Shaman (streamed video). Native Art Traders. Conversation about human to animal transformations in Inuit art, and the role of the Shaman in Inuit life.